The ombre hair trend (where dark roots fade to lighter ends) refuses to go away (we love it really) and now it’s hit our nails, too! Beauty Editor, Stephanie, shares her tips on how to get the look. Step 1. 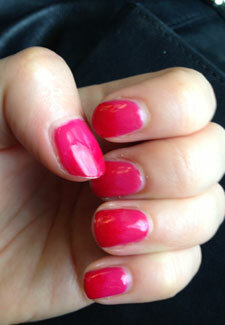 I opted for a subtle pink to red effect using the Red Carpet Manicure Kit, £89.95, to achieve the look. Because gel polish doesn’t harden until it’s cured under the lamp, it’s great to play around with effects like this. Step 2. Paint two coats of pink polish across the nail. Step 3. Apply a little red polish to a wedge sponge, like Boots Soft Cosmetic Sponge Wedges, £1.95, then dab on to the nail, blending from the middle of the nail. Step 4. Apply a couple of coats of red, concentrating on the tips of the nail then add a high shine top coat.